In the digital age, punching a time clock almost seems like an anachronism. Yet many of us still do get paid for the hours we work each week, and if you’re an employer, time is something you need to track to make sure your employees are being compensated properly. Setup is simple. When you first open the program, a wizard walks you through a brief Q&A that solicits information about your business’s time tracking: how many hours your employees are expected to work per week, how often you pay your staff, what constitutes overtime, and whether you plan to use the program as a standalone time clock or as a time clock server on your network. Once you complete the initial setup, you’ll need to add users so that they can begin clocking in. Virtual TimeClock Pro can also import your employees’ data as tab- or comma-delimited text, which can greatly ease the manual setup process. With Virtual TimeClock Pro, users on your network can easily clock in and out from their own computers. As soon as you’ve added employees, the program is ready to use. If you’re running it on a single, centrally located computer, staff members can simply select their name from the employee list and then press the Start Work button. If you’re using it as a networked time clock, the program will ask to connect to the Virtual TimeClock Pro server the first time your employees log on. The client application will locate the server on the network, and from that point forward it will connect automatically. 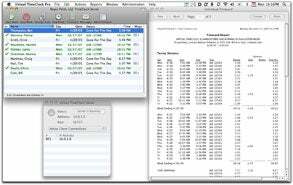 Virtual TimeClock Pro offers a variety of useful reports. You can track employees’ work hours and their accrued personal, vacation, and sick time; you can also see listings of workers who are currently signed in. But while the application can export time clock information directly to CheckMark Payroll ($249, checkmark.com), it’s difficult to move this same information to MYOB AccountEdge ( ) or Intuit QuickBooks Pro ( ), as the program requires you to figure out how to format data for these apps and export it appropriately (the company currently has no plans to increase the level of compatibility with these applications). Virtual TimeClock Pro has some other minor weaknesses. While the application enables you to secure each user’s punch-in and punch-out times with a password, it doesn’t actually allow employees to change their own passwords. This saddles you, the administrator, with the task of creating unique and more secure passwords. Also, when I initially set up the program as a time clock server, I was unable to connect to it from the client computer on my network. That’s because my server had a firewall running that was blocking the port I needed to connect to it. It would have been better if the program had detected the blocked port before allowing the server to even run (the company plans on fixing this issue). I was also able to open the application’s administration panel and make changes (to an employee’s contact info, for example) from two different computers at the same time, making it possible for one person to overwrite another user’s changes. Virtual TimeClock Pro 5.6.1 offers easy setup and very good time logging features. Unfortunately, it falls short when it comes to administrative tools, integration with popular business accounting packages, and advanced user security features. And that makes it an imperfect choice for larger businesses.